Children age 14 and under are invited to help Community Savings Bank trim its holiday tree this season. Stop in and pick up an ornament in the main lobby starting Tuesday, November 24. Decorate it at home and return by Saturday, December 16th to hang on our tree. All kids who participate will be given a “thank you” goodie bag. Marisol Gaytan, Community Outreach Officer said: “Every year Community proudly displays a beautiful holiday tree in its main lobby. We encourage kids to be creative and put on their thinking caps this holiday season. 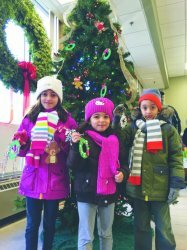 The bank looks forward to adding many festive, new ornaments from kids in the neighborhood.” Community Savings Bank is an independent neighborhood financial institution located at Cicero and Belmont Avenues in Chicago. Community has been located in the neighborhood for 70 years and at its current location since 1953. Community Savings Bank is a member of the FDIC and is an equal housing lender. The bank is located at 4801 W. Belmont Avenue, Chicago 60641. Telephone: 773-685-5300. Website: www.communitysavingsbank.bank.